Most gold owners are familiar with worries of forced government gold confiscation – that one day black-ops shock teams will toss homes to find that stash of coins and bars. Video proof is better then arguing. Record any unwanted incidents for your protection. I doubt there will be PM confiscation in SGP. What do you think? But interestingly, if the people at the top really want to track, I help them buy also not much use....isn't it? I personally dont think it will happen here. But anyone has any thoughts on this? 1. 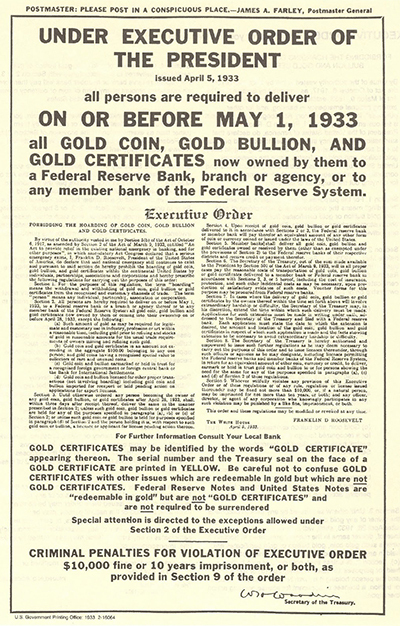 The government has legal power to control any dealing in gold and to effect its surrender under the Exchange Control Act. 2. Since 1978, based on powers granted to it by Section 33 of the aforementioned Act, the MAS (via Notice 1103) had suspended all forms of control on gold and forex. 3. Section 1(2) of the Act states that the validity of the Act was for 1 year following its coming into force (in 1964). However, the various Finance Ministers have continued to extend the period in which the Act is in force over the years (using powers granted under Section 1(3)). The latest extension was done in 2013 and is valid for 10 years. 4. As such, in theory, all it takes is 1 simple MAS Notice and the control of gold and forex will be back in place. Last edited by admin; 18-10-2015 at 09:07 PM. All times are GMT +8. The time now is 12:58 PM.